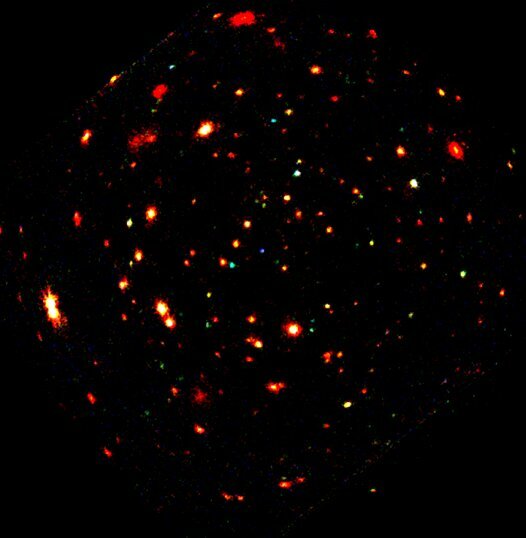 Explanation: Early on, x-ray satellites revealed a surprising cosmic background glow of x-rays and astronomers have struggled to understand its origin. Now, peering through a hole in the obscuring gas and dust of our own Milky Way Galaxy, the powerful orbiting XMM-Newton telescope has recorded this deep image of the x-ray sky, resolving some of the mysterious background into many faint individual sources. The tantalizing image is color-coded, with red representing relatively low energy x-rays, photons with 500 or so times the energy of visible light. Green and blue colors correspond to increasingly energetic x-rays with up to about 10,000 times visible light energies. Notably, the faint sources tend to be green and blue, showing x-ray characteristics of huge amounts of material falling into massive black holes in very distant galaxies. Do massive black holes reside in the hearts of all large galaxies? The XMM-Newton results add to the growing consensus that they do and that, from across the universe, x-rays produced as matter feeds these black holes account for the cosmic x-ray background.